Q: Why does Mendoza haul the armor in the netting? Father Gabriel: "If might is right, then Love has no place in this world..."
The movie by Roland Joffe was not popular in my country when it was released since such movies were censored by the communists. When, however, the situation changed in 1989, I remember that I saw THE MISSION for the first time on Polish TV in 1995 as a part of cinema's 100th anniversary celebration. The movie moved me so much that I have come back to it several times since then. Each time I see it, I find something new in the film. Therefore, I consider THE MISSION one of the very best films ever made, a film where history meets single individuals, where sadness is conquered by joy and disbelief and skepticism by profound thoughts on humanity. The content of the film, though historical, applies perfectly to modern times. The universal struggle of two spirits, the one of might and the one of Love, has always been noticeable wherever and whenever people live. Let us look briefly at the gist of the content: the Jesuits build a mission in the core of a jungle in South America, they understand the heart of the Gospels: Love without looking for reward. Yet, the politics of the conquerors (Spaniards and the Portuguese) steps in and destroys the mission... However, not everything dies even though goodness seems to be conquered... This story, presented here in a condensed way but developed in the film is so powerful that it leads to reflections: what, in fact, reigns in our lives; why good people have to suffer, why we are forced to do what we hate, it is so effortless to destroy while to build requires so much strength, why the world turns our good deeds into evil, etc. This aspect is the pearl of the film and the feast for the soul even though such thoughts require some courage from an individual. I reflected on the fact if I am willing to support the weak or if I rather choose might which is my master I attempt at in my actions? It's strange but we will never get to know our personalities completely... And that is what the film also shows. Altamiro (Ray Mc Anally), for instance, is a person of different psychological states hard to evaluate. The performances are exceptionally powerful which makes THE MISSION a very nice piece of film art. Jeremy Irons gives a very powerful performance as Father Gabriel expressing all values a good Christian should own: goodness, gentleness, patience, courage, and purity. He has this blink in his eyes that makes his portrayal particularly memorable. Robert De Niro... I would say frankly that this is his very best acting. 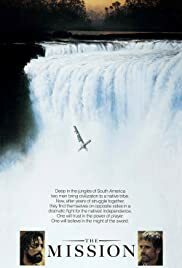 People concentrate on different films when they hear of De Niro's performances, particularly in Michael Cimino's THE DEER HUNTER (1978) or in Martin Scorsese's CAPE FEAR (1991). Some of them skip THE MISSION. Yet his portrayal of Rodrigo Mendoza is a masterpiece in its own. This role is difficult to portray since Mendoza is a man of two contradictory spirits: from a slave trader to the devoted Jesuit. Nevertheless, De Niro does a marvelous job. One moment caught my attention from the first view of the film: Mendoza's death and this nostalgic look at Jesus in the Eucharist (even while writing about this moment a tear appears unintentionally in the eye). Ray McAnnally portrays Altamiro, a bishop who is forced to do what he actually does not intend to. He seems to be touched by the mission and in spite of that, he finally allows for slaughters. In the final shot, he expresses one thing powerfully: a face of a man whose conscience will forever suffer. "Thus we have made the world...thus have I made it," which are his words said at the end by him clearly show what kind of person he was. Another powerful aspect of the film is music. Ennio Morricone is famous for having written music to many films but here, in THE MISSION, he did something absolutely sublime. I bought a CD listening to music alone and it was an unforgettable experience for me. People who heard it and did not see the film asked me where I got such wonderful tunes. Indian rhythms combined with Christian spirituality and ecclesiastic chorus - UNFORGETTABLE! I promise you that having seen this film, you will never forget, among other things, these lovely tunes. The filming locations, which obviously constitute an additional aspect in any film, add a thrill and authenticity to everything. It is hard to imagine other places in THE MISSION. The movie is shot mostly in the places where the historical events took place. We see the mighty Iguazu waterfalls, the jungle where Guarani Indians live, the city of Cartagena in Colombia as well as the hills of the Brazil-Argentinian border. What more is there to say? I think that most readers will agree with me that THE MISSION is a masterpiece, a film that opens people to new horizons of understanding the profound thoughts that are there in our lives if we are willing to reflect on them or not. Speaking religiously, Christ has once died on the Cross but then all was conquered by Love. Father Gabriel, you are right. It seems that Love perhaps has no place in this world and might may seem to be right but it is always Love that wins since "the spirit of the dead will survive in the memory of the living."